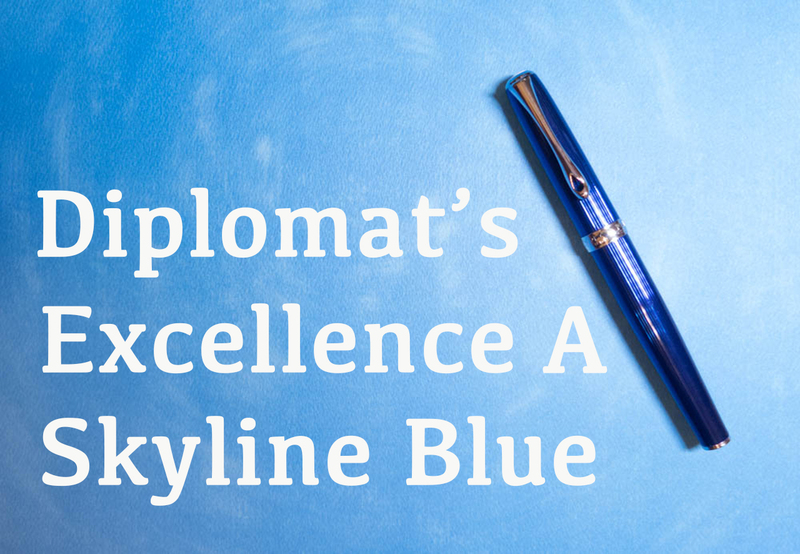 Diplomat Excellence A - Skyline Blue - Discount Code and GIVEAWAY! | Inkdependence! Often a green finish will catch my eye, but it is the nib and writing experience that really makes the sale for me. I like odd materials, like delrin, micarta, G10. Those are always interesting, and rare. But generally a sharp italic is a better selling point for me than a fancy body. Finish and color are not the most important factor for me when buying a pen, but I really like both ends of the spectrum. I like clear demonstrators that are light and I like metal pens with some heft to them. The most unique pen I have is a Twiss Pen made from a green snakeskin Parker celluloid. I have been impressed with everything that I have seen from Diplomat. When I first heard about them a few years ago, nobody I knew had really heard of them, but they have blown up on the scene over the past year or so. I tried the Excellence A and the Aero at the D.C. and Baltimore shows and fell horribly in love with the brand. Sadly I do not own any... yet. Thank you for the great review and giveaway! I like demonstrators. Flashy green pens also catch my eye. As soon as I saw a photo of the Jinhao shark fountain pens on Facebook I bought a bunch. If I had the disposable income, I'd buy a bunch of those awesome swirly Edison pens. I like variety in my pens. Intricate patterns are more often than not what I gravitate to. Interesting texture even moreso. On a side note, it's good to know that the ARC paper is FPF, since Levenger decided to discontinue the paper I was using. Just wish there was a dot or a smaller grid layout. Any other discbound options out there? I like demonstrators and metallic finishes :-) nice giveaway, thanks! I love the subtle swirly acrylic patterns, and squared off ends. At least, that's what does it for me right now. Acrylics and celluloid with lots of depth. I am partial to green, especially muted hues and earth tones. Color and material are two design features I look at. For instance, I am drawn to orange and blue pens made from celluloid or even metal; pens cannot be smallish as they do not tend to fit well in my hand. I like pens with color. The blue in this pen with the line pattern in the body looks awesome. I love a nice green pen, the darker the better. Lime green can get bent! Blue is my favorite color. This is an amazingly beautiful pen. Awesome review. Love your energy. Thanks for the opportunity. I'm a sucker for the tortoise brown finish. I particularly like the tortoise brown color on Pelikans. Love all blue pens, any material. Demonstrators are on the top of the list, There are too many good colors out there, but if i had to pick, clear on demonstrators (to best see the inner workings) and red for the others. Tough question, but truth is my most used pens are sterling silver. My fave pens thus far are the Pilot Silvern and the Parker 75. Thanks to you and Points of Distinction for the giveaway. Beautiful color on the pen and I could almost see how smooth it wrote. Thanks for all the great work you put into your reviews. I've been watching them for quite some time now and appreciate them very much. I'm excited to participate in the giveaway also! For me, I like to look for things that are different than most of what I have in my collection already, so there's not generally one finish or color that I go for more than anything else, but rather things which are unique. Having said that, though, I do tend to go for more conservative, darker colors on most of my pens. I generally like that more classic look. Those two factors together made last year's Platinum 3776 Kawaguchi impossible to pass up. I like finishes that are colorful. I'm not too concerned about the mateial, but I like my pens to have color! I look for a great nib first and then pen materials. I do like metallics and acrylics. I'm interested in trying micarta and other materials. Thanks for the blog and the great information. I like multicolored materials. On the big and heavy side. Not wood. I like some thing fun and unique! Great video. Judging by what is here on my desk, I'd say demonstrators. If you'd ask me that when I'm not sitting at the desk, I'd say COLOR! but that's probably not as true as I think. But it's irrelevant if it doesn't write great. I like understated pens. I tend to go for dark reds or burgundy color pens. Add a lacquer to that and I'm probably sold! Such a shame not being able to get the 3th entry since I don't have an instagram:/ Oh well, hope I get lucky Either way! Thanks for the chance of winning the pen Matt, talk to you on the Friday chat! Oops. Shudda read the contest first. I've been on a hunt for red acrylic pens with lots of depth and complexity. Being new to fountain pens, I don't have experience with a lot of different materials, but the color and design of a pen will draw my eye. I like to match my ink to my pen, so I have many different color pens, though I tend to prefer the bolder or deeper colors. Mike, thank you for giving us the opportunity to win this pen. I don't have a Diplomat, but I've heard good things about the nibs. (Which is even more important than the color or finish!) :-) I'm keeping my fingers crossed! Deep blues, materials with depth and motion, or stealth pens tend to make me hit the purchase button. Thanks for the giveaway. The colour blue and rhodium trim will automatically get me interested in a pen! Thanks for the giveaway. I love anything tha isn't typical. Unusual colors, styles, materials. You name it. I like each of my pens to be beautiful to look at as well as be functional. That color and finish is very impressive. Great review, awesome giveaway and excellent discount code. Thanks! That finish is beyond mesmerizing. Normally I’m not a fan of blue, but for this beauty I’d make many an exception. For me it's much more on a pen to pen basis. But in looking over my currently inked pens, I seem to gravitate towards matte, stealthy finishes on metal pens and clear demonstrators in acrylic. I don't like metal sections at all. I like lighter, warmer materials like Celluloid and Ebonite. Colour wise I don't really like red, but greens and blues work well for me. No one particular finish--my pens range from FC Purpurae to Black Aluminum to Platinum Bourgogne (and that's just the most recent buys. Thanks for the giveaway, Mike, and for the help acquiring said FC at the Chicago Pen Show. The thing I look for first is a colorful, but not overly loud, resin/ acrylic (or celluloid, if I can afford it) finish. After that all aspects come into play. While I like having a few black pens, they are not a usual choice. Finish is important to me. Maybe even more than writing performance, as I can tune a pen later put I can't really change the appearance of a pen save for distressing it (like a copper/brass pen patina). I like to have a wide assortment of finishes to choose from. Nice review! Thank you so much for the giveaway! I like demonstrators most of all. I also prefer blue finishes. Anything that is a Deep Blue is an instant eye catcher, I have so many blue inks that are very similar. Another thing that I love is demonstrators, just love watching the ink swish and flow in the pen. A deep blue finish is nice and a non slippery section makes it perfect. Generally I like metal as a body material, but I prefer aluminium and light metals to brass because I can't write for a long time if the pen gets uncomfortably heavy. I love demonstrators or matte black finishes. For me, a finish that is totally different from what I have already will catch my eye. Even though there are various colors or patterns that I really like on pens that I have, I'm always looking for something new and different! Some finishes instantly grab me but it's hard to make a generalisation. I have to say I love the look of Maki-e pens (expensive taste). I also quite like that classic Piano Black glossy with Gold Hardware look. If it's metal with lacquer that is also really cool particularly if Blue or Green. I'm in love with celluloid pens - they're just so beautiful! My 2 favorite pens are the Sheaffer Balance and the Parker Vacumatic so striated celluloid floats my boat. As for plain colors. I can't resist anything orange. heh. I really enjoy marbled Celluloid and aurolide materials. I like semi-transparent resins & acrylics. I haven't bought one because of cost, but I really want a copper pen. Otherwise, I'm partial to a demonstrator. Anything that doesn't have a metal section is up for grabs in my opinion. We need more modern celluloid! I like demonstrators or at least partially translucent. I don't give any attention at all to material, color or looks of the pen, I'm mainly interested in the nib width and performance, flex (or lack thereof) and price. Looking at my own collection, it seems that I have quite a variety of colours materials and finishes. I think the only thing I can say is that a pen can't be too outrageously gaudy to my eye. That would be an immediate no-buy. I am partial to the color blue. I love a sky blue with matching ink. That is a real pleasure to write with. The color is really nice. It draws your eyes to it. Not partial to the materials but to the design and looks. I really like the Diplomat pens...especially the Aero model. The Excellence looks like an amazing pen in that colour. Mike, I agree with you that this is one of the nicest Diplomat pens that I have seen thus far. It seems far more elegant than all of the others and would make a fine addition to any collection. I love that blue color as well. Very nice review. I've but this a Diplomat fan for a long time especially for roller ball pens, but this pen is especially beautiful and I mostly carry fountain pens these days. Color, Material, and Finish are not the most important factors in my decision process when buying a pen. Nib type and filling mechanism are typically my top two considerations. Though, at present both of those are currently coming after Country of Manufacture - I've decided that having a pen from as many German manufacturers as possible is my current #1 criteria for spending money. So far, Diplomat, Lamy, Schneider, Faber Castell, and Pelikan are represented in my collection. With Kaweco, Staedtler, Cleo Skribent, Rotring, and MB somewhere in the future. Purple, that is pretty much my biggest draw to buying a new pen. Finish, usually shiny helps sway my direction. Currently in love with transparent tortoise celluloid... both the light and the more natural dark. I have a diverse collection... the common thread is an understated elegance. I confess I love Japanese pens. Consequently, I have a large collection of the NOS Pilot MYU, Murex Black and Red, and NOS Pilot custom steel pens. I agree with you about the steel nib, Mike!! The design and functionality of these pens is out of this world! Thank you, Mike, for such a thorough review of this beautiful Diplomat. Blue, however, is my favorite color!!! The material from the Platinum 3776 is pretty awesome for me, but I think those on Edison Pens are even more! Let's not forget the most recent creations of Mr. Brooks!!! I love all things retro-looking, clear, or bright green usually....but all bright colors are welcome in my book! Thank you for your amazing content. My husband has TWO Diplomat pens that he loves and I have NONE. This shiny blue one is FABULOUS! My husband has TWO Diplomat pens that he loves and I have NONE. This shiny blue one is FABULOUS! I am posting this second comment not to try to cheat, but because there was no link to my e-mail on the other comment. Thanks! I like bright blues, like this skyline. Also dark blue with gold trim. I love blues and greens! And bright, saturated colors. Pam Scala likes bright colors and patterns. I love simple acrylics like the latest Sailor 1911s in Anchor Grey and Fresca blue. I look for a functional pen regardless of the material, but I confess I have a weakness for blue anything. The blue on this pen is stunning! I like wild colors but if a pen is blue I like it. I've always loved solid colors, swathed that use one material and color to really highlight it's beauty. I wish I'd have gotten one of the TWSBI Micarta pens when they were available... I'd love to find another Micarta pen sometime. Blue is my color, especially teal or turquoise, so those always catch my eye. I am a sucker for blue pens. The Stripes on the Diplomat look great on video. I can only assume it looks better in person. I am a novice at this hobby, I actually do not yet own any modern pens. There are so many choices out there that I am really having a hard time deciding on what to get - I am spoiled for choice in both pens and inks!!! I've bought several vintage pens locally off Craigslist, OfferUp, and Letgo, that I intend to restore; of those, I like the ones that have a sense of depth in the acrylic or resin and I also like the ones that have some chatoyance to them. I like some of the acrylic patterns that Edison has out with the really defined lines running through. I like deep blues, deep greens, and classic black. Demonstrators are cool, as long as they are not a cartridge converter. I really like the look of this Diplomat! Cannot pin down color and finish but something colorful with a bit of pizazz ususally does the trick for me. This pen certainly meets that criteria. Great review, thanks! Some kind of unique material might catch my eye, or a demonstrator of some sort with extra flair. I prefer demonstrators, but for this pen, a finish similar to the M805 stresemann would be really cool. I love pens that are matte black. For example, I like the finish and color of the Sailor Pro gear Imperial Black and the matte black pilot VP. Odd ones I have not tried before. Looking at getting my first ebonite pen before too long. I really like pens with dark background and sparkles embedded...something that catches the light and twinkles! Thanks for the review and givaway. Never knew about Diplomat and learned a lot. Hi Mike! I like demonstrators with some texture, like the Omas Ogiva Cocktail and Alba, for example. Rhodium trim wins out for me! I generally like matte finish because they provide some extra tactile feeling. I am such a sucker for the Franklin Christoph demonstrators with any of the Ice finishes! I always tend towards pink or filet pens, though any pretty color catches my eye I'll swoop down to investigate. I like shiny finishes. Materials don't matter as much to me. I'm still new to the hobby, so I'm still figuring out what I like. That said, I love blues and purples and boy do I wish I had gotten into fountain pens when the Twilight version Vanishing Point came out! I'm commenting anonymously, but I am subbed to your youtube channel as texasnightowl. For whatever reason, my first choice is usually a demonstrator. More fashionable pens I go for gold or silver. I am trying to move up to the executive level so blue would be good in a fine. But then my favorite color is red, a hundred years ago I actually had a Parker Duofold red that I cannot find. Very cool! I keep wanting a Diplomat. Regarding material...it really depends on the pen and the look for opaque versus transparent vs translucent. I'm pretty much a sucker for all things blue, and for cigar shapes. Material and finish are less important to me. Cool review! Thanks for the pen! I think a lot of what makes me want to buy a pen, aside from performance, is the material it's made of more than the color. I like materials that feel sturdy and give some weight to the pen. Resin, metal, wood, bamboo, etc. Some particularly intricate finishes also draw my eye, though. I like stealth colors and metal pens. Matte black, grey, dark greens. Nothing bright. I've heard some good things about Diplomat so it would be nice to have a chance at one! That is a gorgeous pen! I love blue pens! I like to get a mix of colors, but my two favorite colors of pens and inks are blue and brown. I like blue or black with a functional clip. That said, I have other fountain pens that I enjoy, too. I really like blue, black, or white colored pens. Leaning toward demonstrators at the moment. I've always loved demonstrator/transparent pens, so I tend to gravitate towards them. Additionally I like bold, eye catching colors. The only solid black pen I own is one I've won. I've never bought a solid black pen for myself. Thanks for the giveaway, Mike. If you insist, I will take one more orphan Diplomat into my home. Thanks for the review and giveaway! I like conservative looking pens that aren't the traditional cigar shape with rounded ends. A Good texture or iridescent finish will attract me to a pen. pretty much anything except for slick metal is something I will consider. Thanks for the opportunity. Honestly, I love conservative looking pens with a bit of interest to them. The Pilot Custom 823 FA is my favorite pen because while it is a conservative pen, it has quite a bit of depth to its material. Also, the FA nib has some beautiful bounce to it that is pretty unmatched in modern pens. Just a fantastic pen. I have quite a few demonstrators and black pens. Thanks for the giveaway! I really like pens with a bright color finish. I like clear also! I tend to go for more subdued pens. My favorites are my Lamy 2000s, but I have colored pens like my Pilot Custom 92. The critical thing is that the pen can't be so flashy that it's noticeable across the room. And, more importantly, it has to have good cap-on performance. I like keeping a lot of pens inked up and it drives me crazy if one won't write when I pick it up. I tend to like more traditional colors and shapes for my pens. I really enjoy the good writing experience. Blue is my all time favorite--especially cobalt, royal, or indigo. Same is true for inks. I have a Diplomat Esteem in Cobalt, and it's easily one of my favorites (currently inked with iroshizuku tsuki-yo).